Students gathered in Alumni Arena for UB's Career Fest in Alumni Arena Wednesday. Career Fest is the university's largest career fair that is held annually. Alumni Arena was filled with students Wednesday, but they weren’t packed into the stands in blue and white attire screaming for the Bulls. They were down on the court wearing suits and dresses. UB held its annual Career Fest for UB students and alumni in Alumni Arena, which offers opportunities to speak with representatives from 123 companies from the Buffalo area and across the United States about internships and part- and full-time jobs. This year’s Career Fest gave students a new app to help them navigate the event, but some were confused how to use it and complained the app’s listing of different employers’ locations was not easy to navigate. Others even said some of the app’s information was incorrect. The app, named “UB Events Guide,” listed the location of each of the 123 employers in Alumni Arena and offered information about employers, like what kind of students should apply to a specific employer and what positions they were offering. Chin said he wished the employers were split up into broad categories based off of what type of majors they were looking for, like engineering or communication. Other students voiced similar complaints about the lack of employer organization in the app. The “Smarty Squad,” the technical support team at Career Fest, did try to assist students who were confused by the app or couldn’t find information. While one attendee vocalized how much he disliked the app because it didn’t show where each employer was located, a student volunteer came over and showed him how to find that information on the app. “We figured that everyone is attached to their cellphones anyways, so they can use the app [instead of a physical map],” Strough said. Strough also helped students figure out how to use the app as a “Smarty Pant” member of the Smarty Squad. “If students have questions about the exact location of an employer they can come to us and we can help direct them where to go,” Strough said. Joe Fierert, a senior math major, voiced complaints as well. One of Fieret’s friends went up to a table that, according to the app, was looking for mechanical engineering majors, he said. His friend was disappointed when he got up to the table and was informed that they were actually looking for computer science majors. This wasn’t Fierert’s only problem with the app. Although some students did have a lot of problems with the app, others found it very useful. 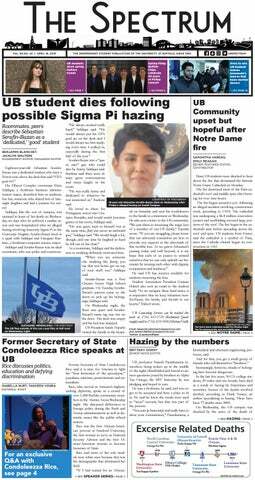 John Jacobs is the assistant features editor john.jacobs@ubspectrum.com.